A young up-and-comer wowed the crowds in the Longines Global Champions Tour Grand Prix of Rome, defeated a field full of international veterans in a stunning win. 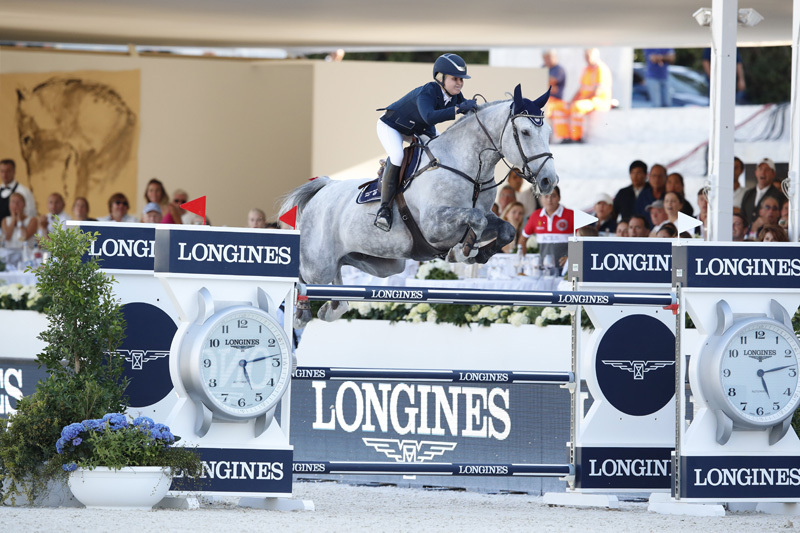 The 24-year-old Swedish rider Evelina Tovek piloted her Castello 194, a 9-year-old, to a jump-off round more than a second faster than Dutch rider Harrie Smolders on Don VHP Z. “It’s the biggest win of my career—it’s amazing,” Tovek said. Tovek, whose sister Isabella is a dressage rider, represented Sweden as a young rider. She gained experience in the Under-25 classes and then started jumping consistently at the five-star this year. Castello 194 got his start in Germany, competing up to the 1.50-meter level with Kaya Lüthi in 2016. Smolders’ second place, however, cemented his win in the Longines GCT series—making history with victory before the final leg in Doha in November has even played out. The Flying Dutchman declared “it feels great” and said he was “really, really honored,” as he celebrated following a spectacular Longines Global Champions Tour Grand Prix of Rome. Clearly emotional after his landmark win, Smolders spoke of the extraordinary caliber of previous champions, both human and equine, and his pride that his name will join the illustrious athletes on the coveted Longines Global Champions Tour trophy. His phenomenally consistent scorecard on the circuit included an LGCT Grand Prix win in Chantilly, podium finishes in Paris, Hamburg and Rome and fourth and fifth places in London, Shanghai and Miami Beach. He credited his achievement as LGCT Champion of Champions to his high performing stallions Don VHP Z and Emerald allowing him to switch between the superstar horses during the series. “My horse loves this venue, which is why I brought him out here again,” said Smolders. “It worked out fantastic today—I was not expecting to win [the championship] today. It’s been an incredible season for me with my top horses Don and Emerald—it’s also thanks to my partners Copernicus and Eurohorse behind me. Our goal was not to be the fastest today, but I wanted to keep clear. Smolders’ lead in the overall ranking going into the 14th leg of the LGCT season in Rome meant there was a chance he would emerge as champion before the final leg in Qatar. Uliano Vezzani’s 1.60-meter LGCT Grand Prix course was a formidable test including colorful fences depicting iconic Rome landmarks. First to go clear was the masterful Marcus Ehning of Germany with Funky Fred, the top German rider with a proven track record of success in Rome. Guiding the gleaming chestnut around the course, the crowd gasped in appreciation as one of the smoothest riders on the circuit put in a foot-perfect round, making the tough course look effortless. But it was anything but plain sailing. With tension running high and the potential to decide the championship, a shock result from the earlier qualifying competition saw both Christian Ahlmann of Germany and Alberto Zorzi of Italy fail to qualify for the grand prix. That left Smolders able to take the title if he held his nerve and finished on the podium and if close contender Lorenzo de Luca finished lower than sixth place. An anxious wait ensued as thousands of spectators lining the stone amphitheater watched to see how the title race would play out. As others took their turn, it became clear that Vezzani’s challenge was a real test, as big names such as Eric Lamaze with Coco Bongo, Sergio Alvarez Moya with Carlo 273, and John Whitaker with Argento all failed to jump clear. It all fell apart for the Frenchman Roger-Yves Bost and Sunshine Du Phare, after their round began to unwind when the liver chestnut dropped a back foot through an oxer. A scary moment as Sunshine napped back towards in the gate, and a further loss of concentration meant the popular rider picked up an unusual 27 faults. Others tried, and failed, to ensure a jump-off. Poles rolled across the field as Kevin Staut with For Joy van’t Zorgvliet HDC, Peder Fredricson with H&M Christian K, Cian O’Connor with Skyhorse and Marco Kutscher with Clenur all fell short of the clear. Anticipation mounted as Smolders entered the arena with his top stallion Don VHP Z. 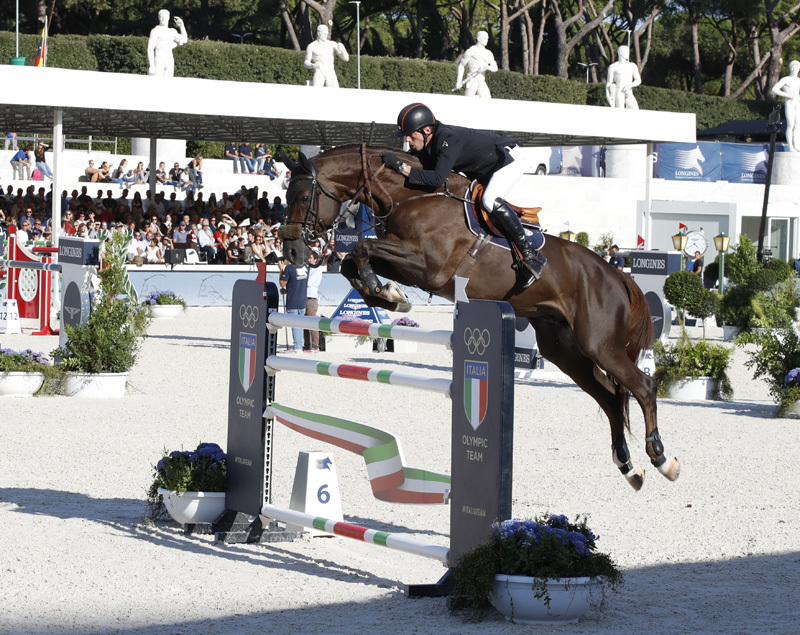 The pair had previously won the LGCT Grand Prix of Rome in 2016, and all eyes were on the former winner to see if he could repeat victory in Rome. A magnificent clear had fans gasping. They were into the jump-off. Only de Luca could stop Smolders’ charge for the championship and he entered the arena to a roaring crowd with top stallion Halifax van het Kluizebos. Spectators held their breath as de Luca cruised around the arena, hoping they would have an Italian in the jump-off. But the first part of the Longines treble came down after Halifax clipped the pole with his hind legs, dropping the pair down the order and meaning the Dutchman would potentially claim the championship. Rising Swedish star Tovek, 24, was the youngest of the field to start the grand prix, but her phenomenal partnership with Castello 194 delivered a spectacular round on the dapple grey 9-year-old gelding. One of the final riders to go, Scott Brash and Hello Forever looked strong as they flew around the course, but an agonizing 4 faults came as Hello Forever trailed a hind leg at the Longines oxer putting them out of contention, despite being the quickest of the four-faulters. So it would be a three-rider jump-off, with the crowd hungry for the final act of a spell-binding LGCT Grand Prix. First to go, Ehning had the hardest task, throwing down the gauntlet to Smolders and Tovek. The pair galloped the course, eating up the long distances and powering around the corners. But it came undone at the oxer heading back to the in-gate, as Funky Fred came in a little too deep and clipped the pole. Ehning would have to hope the pressure would get too much for the two remaining riders, with his time of 47.90 seconds setting the pace. Smolders returned to the ring with Don VHP Z, the pair knowing a safe clear would put them in first or second. Smolders guided the huge stallion around the course, deceptively quick around the sand arena, to stop the clock clear in 52.43 seconds. The pressure was well and truly on the young shoulders of Tovek. This would be the toughest jump-off of her career, and the question was whether to play it safe and guarantee second, or go for it and potentially steal the win. It would be a case of fortune favors the brave, as Tovek flew around the arena with Castello 194, up on Smolders’ time coming out of the Longines treble. It was clear the relationship between horse and rider was strong, and the pair galloped to the final fences with the win in sight. The crowd were on their feet as the duo stopped the clock in 50.71 seconds, more than a second faster and Tovek’s biggest career win to date. 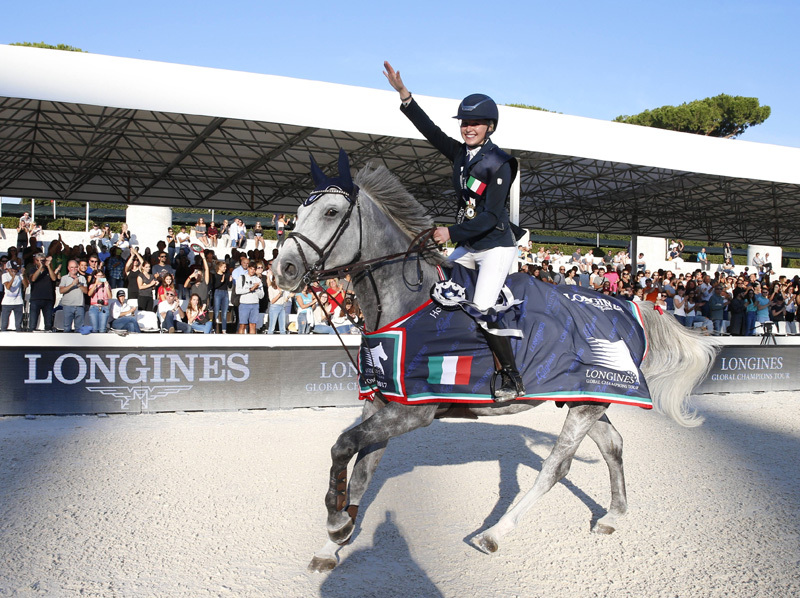 See full results of the Longines GCT Grand Prix of Rome.